Feed 2 scoops (85 grams) per 1,000 lbs body weight on an empty stomach. After feeding Compose® 2x at the maximum short term effect feeding level allow 1 to 3 hours prior to activities such as loading, hauling, training, showing, new environment, grooming, health maintenance, procedures, etc. 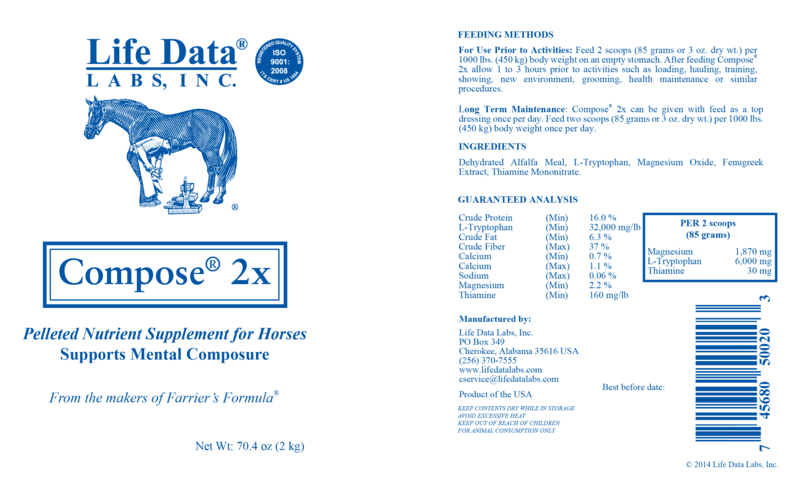 Compose® 2x can be given with feed as a top dressing twice per day. Feed one scoop (42.5 grams) per 1,000 lbs body weight in the morning and one scoop (42.5 grams) in the evening.